Volume loss with aging has been discussed extensively. Less known are the age related skin changes. Skin cells divide more slowly and the layers of skin become thinner and lose their elasticity. The skin is not the only part of the face that is susceptible to time and gravity. The muscles and tissues deep within the facial structures also atrophy and decrease in size, leading to the appearance of fine lines and wrinkles. Our own bodies may possess the ingredients to repair some of these tissues, and reverse the effects of time. With stem cell technology, we may now have the technology needed to harness those healing capabilities. 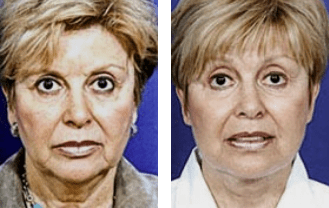 A Minimally Invasive Stem Cell (MISC) facelift is a less invasive surgical procedure that uses the regenerative capacity of adult stem cells to fight the signs and symptoms of aging. Unlike most of the specialized cells in our bodies, adult stem cells have the potential to become any type of cell, and thus can be utilized to replace aging or damaged cells in any part of the body. Fatty tissue contains a large number of stem cells that, when transplanted and awakened, will grow into new tissue at the transplant site. When stem cells and fat tissue are used as part of a facelift procedure, these cells enhance both the volume of the face and the quality and texture of the facial skin, giving the face a refreshed, youthful appearance without scarring or extensive downtime. Using our body’s own healing potential, Dr. Moelleken and his staff at Moelleken Plastic Surgery in Beverly Hills and Santa Barbara can perform a MISC stem cell facelift to address the damage done to our face by time and gravity. As always, Dr. Moelleken will not sugar coat or over represent treatment options. The astute reader has noticed many ‘may and coulds’ in this section, with good reason. While there is great promise in stem cells, there is no evidence they are actually more effective than fat injection into the face, conventional facelifts, etc. There is promise, but as of yet no evidence for stem cell facelifts having any efficacy at all. Now fat injection by itself, with or without fractionation of the stem cell containing components, can be effective at increasing facial volume. So in that sense it is likely to succeed, to the extent that fat injection survives and effects permanent changes in the face. Nevertheless, Dr. Moelleken is committed to this emerging technology and offers it to his patients who are committed to it as well. A stem cell facelift involves the transfer of adult stem cells from a donor site on the patient’s body to the areas of the face that require rejuvenation. The procedure is a minimally invasive option, and can be performed in the office under local anesthesia and oral sedation (general anesthesia is not required, although many patients opt for it). Small needles are used both to harvest the fat tissue and stem cells from the donor site and to deliver the awakened stem cells to the facial structures, minimizing scarring and post-procedure downtime. Immediately after the procedure, most patients will experience mild swelling and will notice that their skin appears red or pink as if sunburned. These symptoms will diminish within a week or so after the procedure. Once the fat tissues and adult stem cells have been removed from the donor site, usually the lower abdomen or medial thigh area, the cells are purified with a gentle blotting technique. These cells are not cleansed in a centrifuge as with a traditional fat transfer procedure, because of the danger of damage that the centrifuge poses to the stem cells. Once the cells have been purified, special growth factors are added to them in the form of micro-hyaluronic acid beads or other additives thought to maximize the survival of stem cells. In theory, once embedded into the facial structures, these beads will deliver growth factor to the stem cells over a period of three months, awakening the stem cells and prompting them to develop into new facial tissue. During traditional fat grafting procedures, the fatty tissue is delivered to only a single layer of the face. During a stem cell facelift, the adult stem cells are transplanted using a multi-layered technique. First, the cells are delivered to the bone in the mid-face region. Next, they are infused into the muscles and tissue structures of the mid-face. During the third step, they are introduced directly below the surface of the skin. At each step, the cells are delivered with a micro-needle to ensure that small packages of cells are introduced exactly where they are needed, avoiding the need for large puncture wounds and greatly reducing the potential for uneven, lumpy results. This multi-layer approach enables the stem cells to develop into facial tissue at every level of the face, resulting in smooth contours and a complete rejuvenation. In most cases, the final step of the procedure is a skin resurfacing using a special combination of chemicals or lasers designed to stimulate the underlying stem cells. This step is performed so that the stem cells will develop into underlying facial structures, but also that they begin producing hormone-like chemicals that will dramatically improve the appearance and texture of the skin. The ongoing improvement of the skin’s quality and texture will continue for up to a year after the procedure. 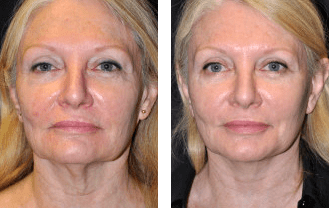 The improved volume of the face will be apparent immediately after the procedure, and the tissue will continue to develop into its final, refreshed shape for three- to four-weeks post-procedure. The second way stem cells are used is as an adjunct to a conventional, or in Dr. Moelleken’s case, a high SMAS or 360 Facelift. The biology and evidence level is the same as for the MISC (minimally invasive) procedure, except that a facelift is performed, and combined at the finish of the procedure with either PRP (see PRP section) or stem cells placed into the surgical areas. The equipment for actually harvesting stem cells is quite complex and epensive, and includes incubators, centrifuges and cell sorters to quantify cell counts. Patients should be wary of ‘stem cell facelifts’ that are simply fat injection, not actual harvesting of stem cells! There is added expense, and little anticipated downside other than the added expense and the uncertainty of the additional contribution of stem cells to the eventual result. Anecdotal reports indicate that the results of a stem cell facelift can be dramatic as well as long-lasting. Again, this may be due to fat infiltration components or to the stem cells themselves. If you are interested in pursuing this emerging and exciting technology, it is important to place yourself in the hands of a dedicated and experienced plastic surgeon. Dr. Moelleken is a Plastic and Reconstructive Cosmetic Surgeon with offices in Beverly Hills and Santa Barbara. He was board certified by both the American Board of Surgery and the American Board of Plastic Surgery, and is a Clinical Associate Professor of Surgery at UCLA. Dr. Moelleken and the caring, knowledgeable staff at Moelleken Plastic Surgery understand that every face is unique and every perception of beauty is different. Dr. Moelleken will listen to your concerns and create a customized plan designed specifically for you. Feel free to contact Dr. Moelleken to schedule your consultation today.